Thanks for stopping by. The details for Shams Ensemble can be found HERE. The ensemble produced a song for Iran’s Green Revolution loosely translated from Farsi as “The Cry for Change,” and it became the anthem for action and involvement. The song became an underground sensation and over a million copies were distributed to Green Revolution supporters. 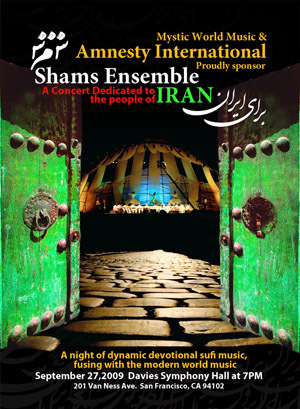 Shams Ensemble is elated that their passionate music could empower the youth to take action for Iranian freedom. BUY TICKETS MEET THE BAND AND HOOMAN!